I am a control freak. That’s freak with a capital F. It is not a secret. I am currently almost incapable of relaxing. It’s not a good thing.My staff and my family are mildly tolerant of me, partially because I get so much done and partially because it’s just how I’m wired so they quietly roll their eyes and try to work around me. I’m trying to calm down though. My goals this quarter include meditating three times a week, and doing yoga three times per week and generally trying to quiet my mind. I’ve been focusing on silence, space and letting life flow. I’m trying not to direct daily life so much. So, I bought myself a $85 bauble to help myself remember to breathe, exhale and love the doing of nothing. 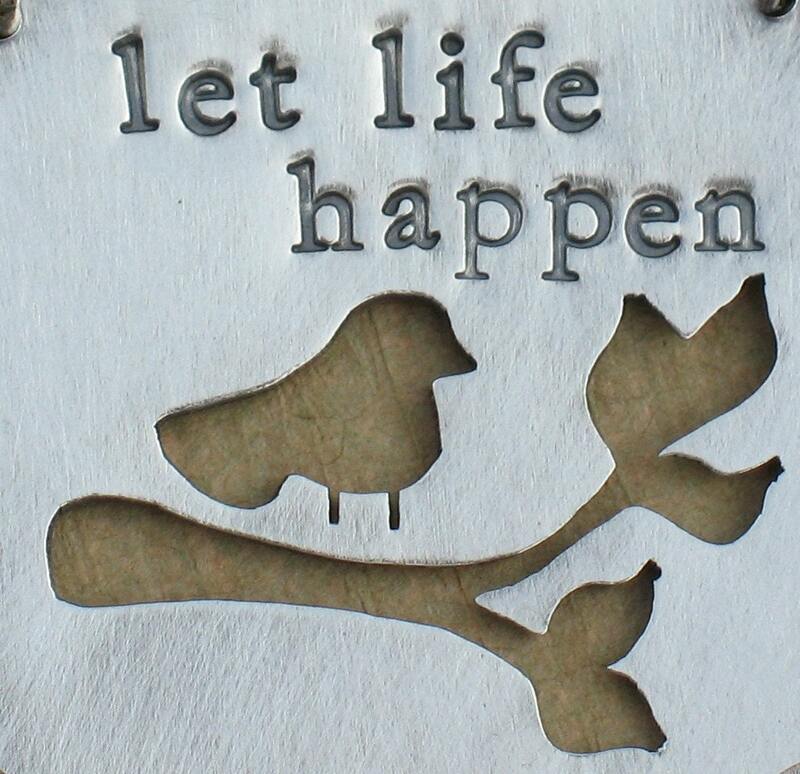 The pendant is 1″x1″ in size. 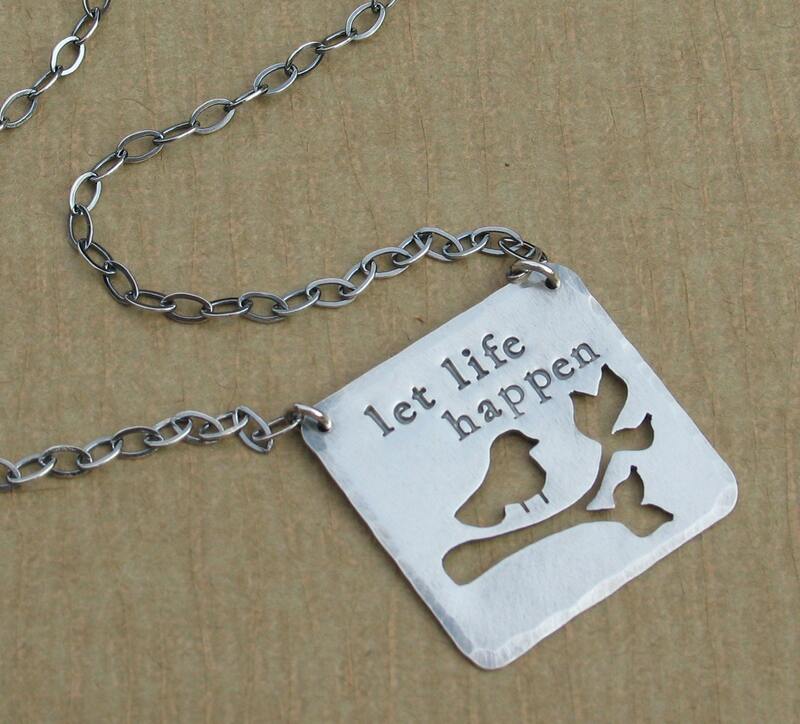 It is hand stamped in my lower case font with the message “let life happen”. The edge has a hammered finished and there is a pierced drawing of a bird on a branch. The piercing was drawn freehand directly onto the metal and then cut out using a saw. The necklace is made entirely of sterling silver and has been given an overall patina. The pendant has a shiny, brushed finish to it. It is 16″ in length and fastens by a lobster clasp. I have signed the necklace on a small tag near the clasp. As always, the connections have been soldered closed for durability. Click here to view her Etsy store. Kathryn also does custom words and designs. So, if you have work to do and want to be reminded of it every time you look in the mirror, just email Kathyrn and invest in your own personal $85 visual reminder. They are ads. I’m working on a plan to actually get the blog to pay for the extra staff time to replace me to work at BB when I can write/take photos/design projects every day. The blog doesn’t need to make money but after 6 months of writing, it probably shouldn’t keep losing the company money either. I’m not loving the double underline thing either though. I’ll keep you posted on how all of that goes … For now, the ads are double-yellow and my links that I put in should show up as a blue color. The double underlined yellow words are a bit distracting because I keep thinking I should click on them thinking they are relevant links to your train of thought… Are they ads? Birds of a feather~ Flock together! From one “control freak” to another… that is a great pendant! !